Fresh black figs in the fall were one of my favorite treats as a child. My grandfather had a fig tree in his yard behind his Brookyln brownstone and, even after he died, the family maintained that tree so it produced wonderful figs every fall. 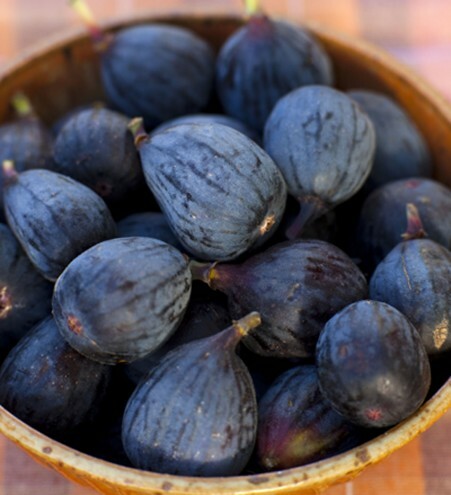 Black figs are a wonderful sweet treat that are low in fat, sodium and taste great. An aunt took an offshoot of it and planted that in her yard, creating a second tree that also produced wonderful figs for many, many year until she sold that house and the tree along with it. Her grandson had an Italian restaurant in Brooklyn for years and he would use figs from her yard for special fall treats there. I’m amazed to see fresh figs in local stores during the early summer these days. I’m sure they’re flown in from California and different parts of the world. Recently I bought some at Costco, as well as at Trader Joe’s and a new store in the Chicago area, Heinen’s. Costco, as might be expected, had the best price on them, two pounds for $6.99 or roughly $3.50 a pound. Trader Joe’s offered them for $3.99 a pound, slightly more, but if you only need a pound, you might want to buy them at TJ’s since figs tend to spoil quickly so you need to eat or use them soon after you bring them home. Heinen’s was more expensive as were black figs at Whole Foods and at a local produce market in my area. A fig is low in fat, 0.2 grams per fig, and practically sodium free at 1 mg. It has 8 grams of sugar, which is relatively low sugar content. And it offers a host of other benefits, like potassium. I’m glad to know there’s at least one of my sweet treat favorites I can still eat, thank you fig growers of the world, keep them coming.